Thank you Deirdre, you are absolutely correct. I left them on and new growth started to appear almost immediately. I have now taken the burnt bits off and it looks like springtime again!! Great! The rule seems to apply to frost-bitten leaves as well - leave on until the risk of frost has passed as though they look terrible, they protect the foliage underneath them. 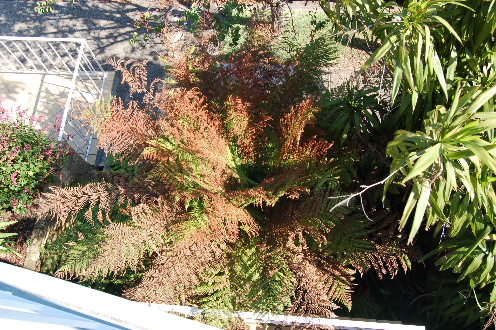 Recent hot days have scorched my tree ferns and I too will wait now to tidy up the brown fronds until the danger of more heatwave days has passed. Comment on "B urnt fern fronds"